Editor's note: FIRST LOOK features excerpts from stories by up-and-coming writers. We hope you enjoy getting to know them! Welcome to Philip Ivory, who lives and works in Tucson, Ariz. He studied literature at Columbia University and is currently furthering his skills as a fiction writer through the Writers Studio Tucson. In addition to appearing in “Dali’s Lovechild,” his fiction will soon be featured in “Bewildering Stories” and "Mystic Illuminations." In his writing work for major charitable causes, Philip has put words in the mouths of notables ranging from Jerry Seinfeld to William Shatner. 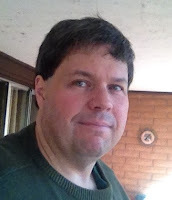 A winner of the 2015 Writer Studios Tucson “Write-to-Read” contest, he maintains a blog at writeyourselfsane.com. The dead outnumber the living. For every one living person waiting for the right moment, acting on the wrong one, squirreling away love, preserving hatred like an heirloom, leading, obstructing, raging, laughing or sitting quietly … ten lives have already passed, their moments, their choices, their regrets, lost to darkness and time. What brings your writing into focus? Often, it’s a solid sense of place, which provides a meaningful foundation from which other details can arise. But more crucially it’s a matter of being confident about your narrative voice. Who’s telling your story, and through what specific lens does he/she/it view the world? The importance of having a firm handle on your narrative point of view is something that is strongly emphasized at the Writers Studio, where I have been taking classes for several years. What are your top three reasons for writing? I have a writing blog which I’ve called writeyourselfsane.com, because my main reason for writing is to keep myself feeling grounded and whole. If I’m not writing I feel slack, purposeless and untethered to the larger world. Writing gives me a reason to be on this planet, the rewarding feeling that I can create something that will have an impact on the thoughts and feelings of others, and it dispels isolation by placing me in a community with other writers. What's the highest compliment someone could make about your writing?It’s very cool if readers tell you they were genuinely surprised by a turn of plot in your story. But what’s most amazing and humbling is if they tell you they were deeply moved by your story, possibly to the point of tears, which has happened to me once or twice. If you could borrow one person's zest for writing and/or life, whose would it be? Why? Ray Bradbury is a great influence not only for his artistry as a storyteller and his ability to spin magic out of the most commonplace of objects and settings. I also admire him for his zestful attitude toward life, his enthusiasm for embracing the adventure of living in all its facets and shadings, from darkness to light. Could you share a bit about your next project? I had a dream when I was a kid. I loved going to the movies but the theaters were too far away for me to get to by myself. So one night I dreamed that, incongruously but magically, there was a movie theater right there in my little residential street. Somehow I had just never noticed it before. For a long time that dream has been nagging at me, whispering: “Make a story out of me.” Finally, I listened to it and began writing what I thought would be a short story. The piece grew from its seminal image into a larger narrative. So now I’m developing it as a novel and hope to have a first draft in the coming months.